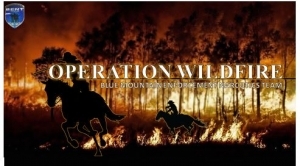 PENDLETON, Oregon – Statistics from Operation Wildfire have been released by the Blue Mountain Enforcement Narcotics Team. The action which involved multiple law enforcement agencies saw 54 people arrested and 16 children taken into protective custody or placed with responsible adults. Three firearms and a set of brass knuckles were seized, and three residential search warrants were served. Among the narcotics confiscated was one and a quarter pounds of methamphetamine. A stolen car was recovered. The sweep resulted in one car chase which police called off because of public safety concerns. There was a standoff and a foot pursuit, and in those two incidents the suspects were arrested. In addition there are an estimated 12 arrest warrants still to be served. Pendleton Police Chief Stuart Roberts says it took months to put the operation together. “Over the last seven months the team has been involved in a series of investigations that meet the HIDTA (High Intensive Drug Trafficking Area) mission of identifying and disrupting or dismantling drug trafficking organizations,” Roberts said. Investigating wasn’t the only effort put in by the agencies that comprise BENT. “They spent a tremendous amount of time not only in terms of man hours, but planning and presenting cases to the grand juries,” he said. Umatilla County District Attorney Dan Primus says Chief Deputy District Attorney Jaclyn Jenkins and the other deputy DAs on his staff were also involved in the investigation and the many grand jury appearances. They were also present during the series of arrests Wednesday – but that’s just the beginning of the work that remains to be done. Primus says it’s a good thing to get the drug traffickers behind bars, but he’s honest about the future. He says most of those who were arrested won’t be going to prison, because of Oregon law. The Oregon Legislature has reduced the possession of certain amounts of methamphetamine and heroin to misdemeanor offenses, depending on the number of convictions a person has on his or her record. Both Roberts and Primus say without BENT, the sweep would not have been possible. That team is staffed by officers from numerous area law enforcement agencies. They are Oregon State Police, Pendleton Police Department, Hermiston Police Department, Boardman Police Department, Milton-Freewater Police Department, Umatilla Tribal Police Department, Morrow County Sheriff’s Office, and the Federal Bureau of Investigation.